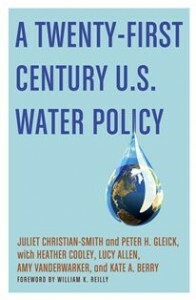 In the new book A Twenty-First Century U.S. Water Policy, published by Oxford University Press, Pacific Institute researchers present clear and readable analysis and recommendations for a new federal water policy to confront our national and global challenges. William K. Reilly, former Administrator of the U.S. Environmental Protection Agency under President George H.W. Bush, calls the new book “a blueprint for reform. Those who care about the country’s water resource policy in all its manifestations would do well to take the themes to heart.” Reilly provided the Foreword to the book. Lead authors Dr. Juliet Christian-Smith and Dr. Peter Gleick argue that the responsibility for properly protecting and managing the nation’s freshwater is not being adequately fulfilled by the diverse federal agencies responsible for them and offer key recommendations for a new national water policy. “The inability of national policymakers to safeguard our water jeopardizes something crucial that most of us take for granted: affordable, reliable, and safe water,” said Dr. Christian-Smith. A Twenty-First Century U.S. Water Policyprovides the first independent assessment of water issues and water management in the United States in many decades, addressing emerging and persistent water challenges from the perspectives of science, public policy, environmental justice, economics, and law. With case studies and first-person accounts of what helps and hinders good water management, the Pacific Institute frames challenges that define our current water issues and offers solutions. Updating current federal water laws and expanding measurement, monitoring, and enforcement. Combining and coordinating fragmented federal water agencies and programs into a national strategy for water resources. Eliminating inappropriate subsidies and inappropriate federal pricing policies for water. Applying environmental justice principles comprehensively in federal water policies to ensure equitable access to water. Integrating the risks of climate change into all federal water facility planning, design, and operation, as well as emergency planning for droughts and floods. Integrating U.S. water policy with other federal resource policies, especially energy, disaster response, and land management. Reviving River Basin Commissions and requiring river basin planning on rivers shared by two or more states. The coauthors, with Juliet Christian-Smith and Peter Gleick, are Heather Cooley, Lucy Allen, Amy Vanderwarker, and Kate A. Berry. The book is available through Oxford University Press, on Amazon, and through your local bookstore. Read the Contents and Foreword. Read the Introduction – The Soft Path for Water. Read Chapter 3: Water and Environmental Justice. Read a Case Study: Green Infrastructure. Download a sample Lesson Plan for Chapter 2: Legal and Institutional Framework for Water.